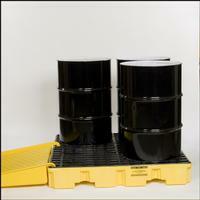 These 4-drum low profile spill containment pallets have a 66 gallon spill capacity. Constructed of polyethylene for superior strength and excellent chemical resistance. 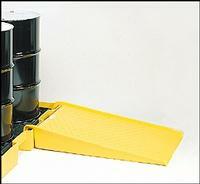 Each unit includes two patented Eagle poly gratings with 1.75" openings that remove easily for cleaning. Forkliftable design with .75" drain plug. Compatible with the optional 1689 ramp, as shown.